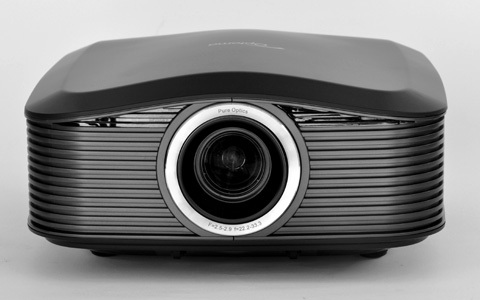 The Optoma HD8300 is Optoma's newest 1080p full HD 3D projector. While the HD33, reviewed in August, covers the low-cost end of the spectrum, the HD8300 is a more refined product that caters to videophiles and dedicated theater enthusiasts. Maximum light output of 1500 lumens means you can power a very large screen, while 30,000:1 iris-assisted contrast creates the deep, dark blacks and nuanced shadows required for a satisfying home cinema experience. When it comes to 3D, the HD8300's image has almost zero crosstalk and plenty of brightness. Sold through custom installers and authorized resellers, the HD8300 is priced at $4,499. We set up the HD8300 on a shelf in the back of a room with very little ambient light. The projector has lens shift, but the shift range is limited, so while a rear shelf mount is possible the shelf needs to be low. Thanks to the 1.5:1 zoom lens, it was easy to get the HD8300 adjusted to fit our screen. We stuck with the default Cinema mode, as it has the best default calibration, and left the HD8300 in its standard lamp mode. The alternative, Bright, is more appropriate for living room and entertainment use due to its very high light output. In a darkened theater, it can be overwhelming. Taken as a whole, the picture from the HD8300 is film-like and engaging. We noticed a few things right away. First, the HD8300 has near-perfect color even before calibration, though saturation needs to be increased a couple of points. Second, the image is very bright in Cinema mode, and in a properly darkened room it can sometimes be too bright. We found ourselves wishing for a manual iris, though videophiles already know that one can use a neutral-density filter to accomplish the same thing. Three, while contrast is good, it's not as good as the old Optoma HD8600 from 2009, the company's flagship model. There's a noticeable difference in black level and dynamic range between the two, with the HD8600 having the advantage in both areas. The HD8300's image is smooth and natural, though digital noise is more apparent than on the HD8600. PureMotion, the HD8300's frame interpolation system, is set to Low by default. In this setting, it subtly reduces judder in film content without adding any of the digital video effect sometimes seen with FI systems. We did not find it objectionable enough to disable, even for 24p film content. In the comparison picture of the Optoma and Panasonic, the Optoma looks brighter in both the dark and light areas. For the Panasonic to have "better" blacks (at least in this picture), it would seem the lighter areas of both projectors should be about the same. I appreciate that you have made an effort to equalize the conditions and setting for the photos of the Panny and the Optoma. But the comparison still doesn't show waht you say it does. The Panny picture seems just darker not more contrasty. Snadler has dark curly hair which in the Optoma picture shows reflected light. That seems appropriate since its outdoors in the sun and Sndler is wearing sun glasses. So the panny picture is better but less realistic. Before I offer my comment, it should be noted that I handle the PR for Optoma. But I also agree with both PatB and John Hermes in that the Panasonic picture just looks darker. To that point, if you looke at the Optoma image, you can actually see the white of Adam Sandler's front teeth, where as in the Panasonic image you don't see it. So while the blacks are deeper, in the example, at least, it is at the expense of lighter details. The comments posted here regarding the screen shot illustrate the limitations of screen shots and why we do not normally use them. The camera imparts its own interpretations of what it sees, then the image is compressed and displayed on a variety of different monitors, which is a different type of display technology than a projector and screen. What you end up with is a rough interpretation of the original scene, but it does not and cannot look precisely like the original. The shot in this review was intended to illustrate the relative differences that we were seeing in real life, which is that the HD8300 is the brighter of the two, and the AE7000 has greater dynamic range and saturation. In order to get the two images on the same screen so they could be photographed together in a single exposure, we reduced the size of the projected images to about 70" diagonal. The images would look different if displayed at different sizes. Perceptions of brightness, contrast and saturation change based on the size of the projected image. In general, screen shots NEVER look like a projected image. In real life you are seeing light reflected from a (hopefully) relatively neutral screen. A computer monitor on which you view a screen shot is light-emitting, a completely different type of video display that imparts a different quality and character to the image. Screen shots displayed on computer monitors make projected images appear more like flat screen TV pictures than they do a genuine projected image. For this reason we typically avoid screen shots since they are by nature misleading. No one should ever buy a projector thinking they will end up with a picture on a 120" screen that looks like the screen shot they saw in a review on a website. Thanx for a great review, I own the HD83(00)myself and am absolutely taken by its PureMotion Frame Interpolation. Where I beg to differ is that in the high FI mode it doesn't add "digital effects", what it does add is reality. The problem WE are having, is that since the day we were born we've all gotten used to the motion blur in theatrical films and on home video. But our eyes can do much better and in reality capture movement vastly exceeding 24 frames/sec. Douglas Trumbull first noticed the problem and introduced 30fps for the showscan theme park rides, filmmakers like Peter Jackson and Jim Cameron are investigating possibilities to overcome the limitations of our now almost a century ancient camera filming process with only 24fps. Thanks to the PureMotion FI details, previously obscured in motion blur, suddenly become noticable, especially objects in foreground that are out of focus, providing valuable information to our brain for a better depth perception of the overall picture and scenery. The scene from ALIENS where the aliens break into the command center almost looks 3D in 2D and the scene from CRIMSON TIDE, where water breaks into the engineering section, made me want to run to the kitchen to fetch a water bucket for all the water I was expecting to drop from my projection screen. We are now watching scenes exactly like the filmmakers watched these while they were shooting, but we will also notice limitations of the studio sets and certain CGI (LotR: Battle in RETURN OF THE KING). Purists and those that have gotten used to the motion blur will probably reject FI, others that have been annoyed by the motion blur (especially ever since these awful handheld, shaken camera movements became fashion) will welcome the PureMotion FI the HD83 provides with open arms. Since "digital effect" has such a negative connotation (Digital Noise Reduction etc.) I felt it necessary to elaborate on the issue and apologize for my lengthy post. Is the HD83/HD8300 shipping? I've found one online retailer in Canada (linked to via your helpful link above to Optoma HD8300 Merchants) but none in the US. Is it available in the US yet? If so, can someone point me in the right direction to purchase it? Thanks! I am surprised that the review says that the panasonic PT-AE7000 does not have visible crosstalk. I went to 3 different stores to see it and it clearly had highly visible crosstalk in my opinion. You can see it easily on a highly contrasted scene with black over white. Batman Dark Knight has a lot of these. i read a review that compared this with the benq w1070, but which is better? i can´t decide which one i should get.